After beginning 2019 with one-dayers, round 12 has seen a return to the longer form of the game and for the first time this season, Cranbourne Meadows are in deep strife. Taking on fourth-placed Officer, the Rebels were unable to string partnerships together as Adam Reid (5/36) tore through the top order with a blistering spell of bowling. Languishing at 6/58, the Rebels were unable to recover as Leigh Boyle (3/60) also kept the pressure on. Eventually, the Rebels were dismissed for just 90 runs and Kulith Rabel (24) was the lone batsmen to make over 15 runs. In reply, Officer stand at 5/101 and will be looking to pile on the runs to begin day two as they search for an outright win. Peter Quinn (25 not out) is still at the crease and the Bullants have done themselves a massive favour in the fight for finals with this performance against the Rebels. NNG/Maryknoll was a class above Carlisle Park on day one of their encounter. The Marygoons struggled early as David Nutting (3/45) took care of the top order, but an incredible 123-run stand for the seventh wicket between Darcy Taylor (93) and Dean Henwood (50) got the innings well and truly back on track. Carlton King (4/101) did a mountain of work in his 23 overs for Carlisle Park. The Marygoons declared at 9/281, sending the Vikings into bat for a tricky four-over period to end the day. NNG/Maryknoll got what they wanted, claiming the wicket of opener Rahil Gandhi (1) to see the Vikings stand at 1/9 at the end of day one. Clyde and Cardinia find themselves in a low-scoring but intense battle at Clyde Recreation Reserve. The Cougars elected to bat first and despite their top order – Daniel Walton (18), Trevor Bauer (30) and Gavin Adams (26) – getting starts, no one was able to really solidify themselves as Kallan Braid-Ball (5/41) and Dwayne Doig (3/55) were in impressive form. Eventually, the Cougars were dismissed for 119 in the 54th over. In reply, the Bulls also got starts from their openers as Kallan Braid-Ball backed up his bowling display with 25 runs and Andrew Cianter (20) got off to a strong start, but much like Clyde, Cardinia was unable to establish any notable partnerships. Harrison Coe (4/3) was in blistering form as his six overs produced not just four wickets, but also four maidens. The Bulls stand at 6/65 heading into day two. Tooradin will have a strong total to defend when they enter day two against Emerald. The Seagulls lost opener Brayden Browne (1) early to be 1/1, but Billy Antoniou (44) and Michael Ralph (72) steadied the ship with an 82-run stand. Clinton Marsh (4/39) was in fine form for Emerald, but Tooradin was still able to post a total of 219. Nyora came to play against the top-placed Pakenham Upper/Toomuc and put on a batting clinic. Openers Jake Hackett (20) and Gavin Hackett (50) set up the innings with a 50-run opening stand, before Tom Cottrell (110) came in and blew away the Yabbies bowlers. Cottrell’s innings was simply sublime as he belted 19 4s and a 6 in a brutal display that helped the Maroons to a massive 277 total. John Nooy (4/24) was impressive in eight overs for the Yabbies. Pakenham Upper/Toomuc will begin day two at 0/5. In a match-up with finals implications, Merinda Park and Kooweerup are in a tight battle entering day two. The Cobras sat in sixth position entering round 12 with a 5-6 record, while the Demons sat in fourth with a 6-4-1 record and neither team gave an inch on day one. The Cobras elected to bat first and their top order was in fine form with opener Lester Betreen (73) and Agyapal Sidhu (44) punishing any wayward deliveries. Andrew Martin (5/39) was impressive for the Demons as he helped limit the Cobras to 9/211 after what was looking like could’ve been a much bigger total. Catani are absolutely in the box seat against Pakenham after punishing the Lions bowlers in a brutal batting display. The Cats got great contributions from Josh Miller (40 not out), Ben Ahern (41) and Corey Fulton (33 not out), while Josh Bethune (57) and Liam Adams (106) partnered for a 131-run stand. Adams’ century was a brilliant knock that saw him completely take over the game and lead Catani to a huge total of 5/323. 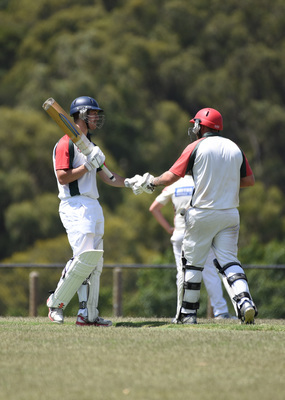 Lang Lang looks in control against Gembrook after their batsmen put on a show. Openers William Wykes (35) and Jess Grima (56) got the innings off to a strong start with a 76-run partnership and the runs kept coming. Daniel Esler (112) put on a show as he ensured the Tigers kept the scoreboard ticking over. Esler combined with Hayden Laidlaw (30) for an important 87-run stand for the seventh wicket that helped push Lang Lang’s total to 299. Jeremy Everett (4/80 in 23 overs) and Daniel Tigges (4/100 in 35 overs) were the pick of the Brookers bowlers.